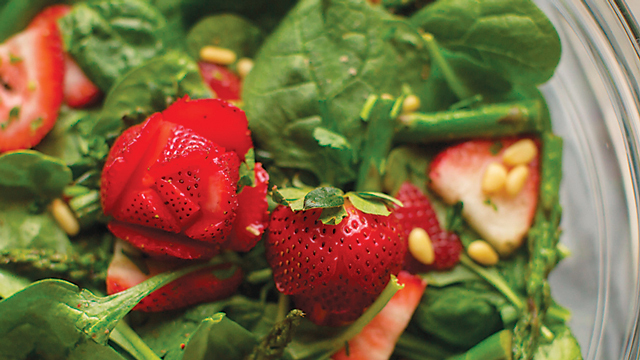 Wash 5 ounces of spinach, and place in a large family-style bowl. Cut 6 spears of the asparagus into 1-in pieces, slice 1 cup strawberries, chop 2 tablespoons cilantro, and measure out ¼ cup pine nuts. In a small skillet over medium-high heat, add 1 tablespoon avocado oil and stir-fry asparagus for 6 to 7 minutes, until it becomes tender and slightly crisp. Remove from heat, and let cool slightly before mixing with the salad greens. Evenly distribute each ingredient over the spinach and dress with avocado oil, another oil of choice, or your favorite dressing. Slice 2 cups strawberries. Sprinkle with 1 tablespoon sugar, and let sit for about 15 minutes. Coarsely crush 1 cup pretzels. Stir 2 tablespoons honey into 1 cup plain or vanilla Greek yogurt. Reserve 4 tablespoons of the honey yogurt. 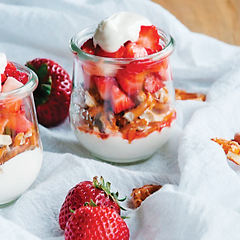 Divide the rest of the yogurt between 4 serving cups, top with the pretzels, and then the strawberries. Top with another dollop of the honey yogurt. and enjoy. Cinnamon tortilla chips: Preheat oven to 350 degrees and line a baking sheet with parchment paper. In a large shallow dish, mix together 2 teaspoons cinnamon and ½ cup sugar. Lightly brush both sides of 4 large tortillas with butter and then drag them through the cinnamon sugar mixture, coating both sides. 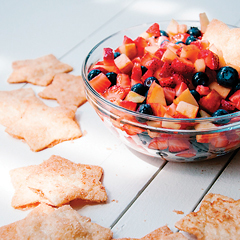 Cut tortillas into stars or stripes. Spread them out in a single layer on the baking sheet and bake for 10 to 12 minutes, until crisp. Cool completely. Salsa: Dice 1 pint strawberries and ½ of a large apple into small chunks. In a large bowl, toss the apple with 1 teaspoon lemon juice to keep from browning. 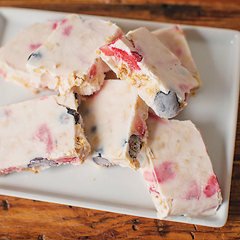 Add 1 cup blueberries, strawberries, and apples with 1 tablespoon sugar. Stir to combine, and serve with cinnamon tortilla chips. Rachel Patterson is the meal-panning mastermind behind these recipes! Rachel Patterson is Relay Foods’ meal-planning mastermind. A registered dietician, Rachel uses the knowledge she acquired in the years spent working with families to craft mouthwatering, nutritious recipes.